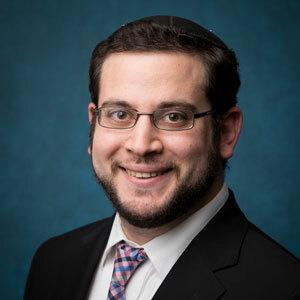 The intellectual and spiritual journey of Rabbi Shlomo Zuckier ’11YC, ’13BR, ’14R exemplifies the Yeshiva University mission in action, not only academically but also through Zuckier’s participation in the Jewish community in multiple ways. In addition to his YU degrees (including two master’s degrees from Bernard Revel Graduate School of Jewish Studies, both earned in 2013), he is a Beren Kollel Elyon Fellow at the Rabbi Isaac Elchanan Theological Seminary (RIETS); he has also received an MA and MPhil in religious studies from Yale University, and expects to finish his PhD at Yale in 2019. He has received a number of scholarships and fellowships (including the Wexner Fellowship), taught in the classroom, spoken from the pulpit, worked for three years as campus rabbi at Yale through the Orthodox Union-Jewish Learning Initiative on Campus, written dozens of articles and edited two books. Zuckier was born in 1987 in the hospital of Albert Einstein College of Medicine, where his father, Lionel ’77YC, ’82E, worked. Two years later, his father, his mother, Lydia, and Shlomo moved to Teaneck, New Jersey, where they were, in Zuckier’s words, “a proud YU family.” All of Zuckier’s siblings studied at Yeshiva University schools. His two sisters graduated from Stern College for Women and one brother is a graduate of the Wurzweiler School of Social Work. The youngest Zuckier brother attended the Marsha Stern Talmudical Academy/Yeshiva High School for Boys and will enter Yeshiva College this fall. The foundations of Zuckier’s current work, both his dissertation focusing on sacrifice in ancient Judaism, and his editorial work at The Lehrhaus, were laid at Yeshiva College. He cites Dr. Moshe Bernstein ’62YUHS, ’66YC, ’69R, ’69BR, The David A. and Fannie M. Denenberg Chair in Biblical Studies, as a formative influence. Zuckier honored his mentor by contributing an article to the Festschrift presented to Bernstein in November 2017 to honor Bernstein’s work in biblical interpretation in antiquity. “The seminars he offered,” Zuckier noted, “were conducted on a level matching any graduate seminar in Jewish studies.” Zuckier also praised Dr. Shalom Holtz, the current director of the Jay and Jeanie Schottenstein Honors Program and associate professor of Bible, for his guidance on Zuckier’s undergraduate thesis. Shlomo also appreciates the direction and inspiration he received from Dr. Aaron Koller, associate professor of Bible and chair of the Robert M. Beren Department of Jewish Studies; Richard Steiner, professor of Semitics (now retired); and Dr. Yaakov Elman, the Herbert S. and Naomi Denenberg Chair in Talmudic Studies and professor of Jewish history at Revel. In addition to those academic mentors, Zuckier is grateful for the theological and spiritual influence of Rabbi Shalom Carmy, assistant professor of Jewish philosophy and Bible, and Rabbi Michael Rosensweig, a Rosh Yeshiva at RIETS and the Rosh Kollel of the Beren Kollel Elyon, among many formative religious influences on the RIETS faculty. Through 2015, they plotted out the elements of the publication; in 2016, they brought in others to fill out the editorial team and prepare for the launch, which happened in October of that same year. “We have been pleasantly surprised by the considerable number of readers who have visited the site,” said Zuckier. “We knew we were filling a void but weren’t sure if that vacuum represented a lack of interest or a real need that wasn’t being met,” he said with a laugh. “It seems that our combination of hard work and faith has paid off,” with The Lehrhaus receiving hundreds of thousands of clicks over its nearly two years of existence. For the time being, the Zuckier family is living in Stamford, Connecticut. Chana, who attended Yale Law School from 2014 to 2017, is currently clerking for a federal judge, Shlomo is doing his dissertation work while participating in the Kollel Elyon and serving as a scholar-in-residence in various communities, and their two daughters are enjoying pre-school and nursery. “I love living in the world of ideas while simultaneously rooted in reality,” he said, and by all measures, he seems well-positioned to do just that. Though the future is open-ended at the moment, Zuckier hopes to spend his career teaching Jewish texts at an advanced level and continuing his thought leadership in the Orthodox community.